November was our last month in D.C. and it went by so fast. We started with a long list of things we wanted to do and we can proudly say only a few things remain. Everywhere we visit we find little places that we could go to again and again. We have those in D.C. now! One of those places for me is the Washington National Cathedral. It is the most beautiful building I have seen in the United States. My chin dropped looking at it. While we were there we took a tour on Gothic architecture that included an English Tea. Awesome! November 11th was Jeff and I's 2 year anniversary! We went to Georgetown and took a walking tour. The tour was outstanding despite the cold. We also went for dinner and some jazz at the Blues Alley jazz club. We went again a few days later to see Jazzmeia Horn perform. We visited the National Museum of African American History and Culture with my cousin Amy. Then we crossed some more museums off our list. We went to the Freer Gallery of Art, the Arthur M. Sackler Gallery, and the Hirschorn Museum and Sculpture Garden. For Thanksgiving we flew to Orlando, Florida to spend time with Jeff's parents. Our first full day there Jeff and Carol wanted to take me to the Florida Carriage Museum. We got there, purchased tickets, and went to go see those carriages. There was one problem. The majority of the collection had been sold which they failed to mention when we bought the tickets. The carriages were pretty cool. What was left of them. Once Stu got out of work we went out for dinner. In every air vent of his car Stu had placed a clip-on air freshener. In case that wasn't enough he had an air wick resting in a cup holder in the back seat. Jeff of course felt the need to point all of this out. It was pretty hilarious. Thanksgiving was a delicious success. Just ask Jeff! We thought we could avoid the Black Friday crowds at the Dalí Museum in St. Petersburg, Florida. We were very wrong. 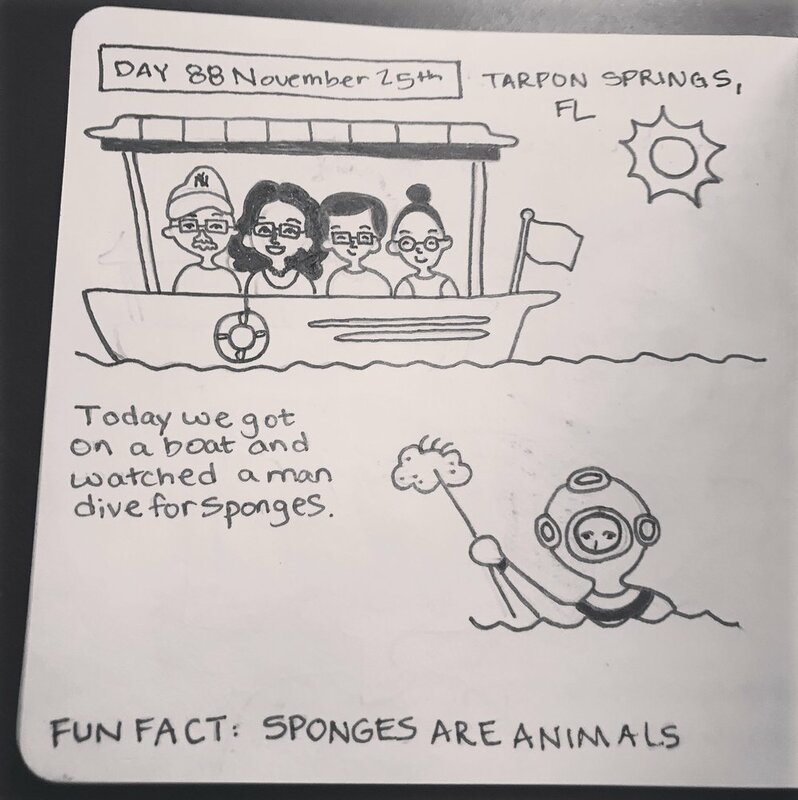 The next day we went to Tarpon Springs, Florida. There we got on a boat and watched a man dive for sponges or in this case a sponge. Stu's words, "One and done." Sunday we hung around to see how well Stu fared in fantasy football. I hung out in the kitchen and made guacamole and tahini brownies. We flew back to Arlington the next day. We went for a tour of the Capitol Building and the Library of Congress. For our last day in D.C. we went to the National Gallery of Art one last time. Until the next time we happen to be in the area! It's now December and Jeff has started a new job in White Plains, New York. It's weird not having him around all day. I finished up some art pieces and sprayed a little fixative on them in a courtyard near our hotel the other day. The store owners didn't like this and security told me so. I guess I did look like trouble sporting a hoodie and carrying a spray can. I am very excited because now I have completed 100 days worth of my daily sketches. I started this project as we left for Israel and planned on being out of the country for 3-6 months. Things didn't go as planned. That happens. We spent about a month in Israel and then 2 months in Washington, D.C..
Finding something to draw everyday was not always easy. However, I am so glad that I stuck with it and plan on continuing with it. Not all 100 sketches made it to the blog but they are all on Facebook and my website. To see them all click here!